The Broad-tailed hummingbird is rather long-bodied compared to other North American hummingbirds. Their long broad tail is also conspicuously larger than Rufous and Allen's. Adult males have a sparkling rose-red gorget*; green crown and back; broad tail with a touch of rufous near the base of outer 3 tail feathers; and white underparts with green/buffy sides (flanks). The outer primary feathers of adult males are particularly pointed, and the wing tips are separated to produce its distinctive metallic trill, which distinguishes it from other North American hummingbirds. 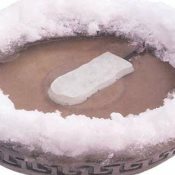 The trill may be faint or absent if the tips are worn. 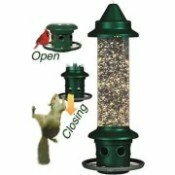 Female: The female Broad-tailed hummingbird is sometimes hard to identify in the field. It is larger, though, than a Calliope and has less rufous in its tail than either it or the Rufous. It has a green back, pale eye-ring, with blended buff on underparts; similar to female Calliope, but tail extends well past the wingtips. Throat with few to a moderate amount of greenish-bronze markings, and no to a few iridescent reddish feathers. Seldom has the central colored cluster of feathers like the female Rufous and Anna's. Central tail feather green, usually without a black tip; outer 3 tail feathers with rufous at the base and with white spots on the outer tips. Note: Occasional older females can have few to many reddish feathers in the throat as shown in the above video. Juvenile Male: Throat usually with heavy, dull greenish markings (Jul-Oct), and with one (by Nov) to many iridescent reddish feathers, not necessarily confined to the center, and usually becoming fully reddish in April of the following year. 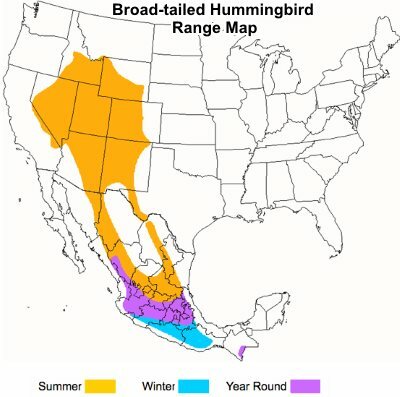 Factors such as weather, length of daylight, & fat accumulation stimulate migration for the Broad-tailed hummingbird. Sexes apparently migrate separately; older males first to arrive and to depart. 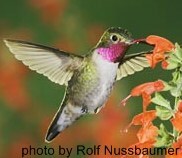 Hummingbirds migrate alone, not in flocks, and not on the backs of geese! Individuals from migratory populations migrate north in the spring abandoning the non-migrant populations in central Mexico. During spring migration, males reach southern Arizona in late February or early March, northern Arizona in early April, Colorado in late April to late May, Wyoming in mid-May, and the northern limits of their range in Idaho/Southern Montana by late May. After breeding, Broad-tailed Hummingbirds start their south-bound migration into their winter range in Mexico, arriving there by August. Males arrive before females and juveniles, occupying the best quality territories. Broad-tailed hummingbirds breed from Nevada, Utah, and Wyoming to east-central California, Arizona, New Mexico, Colorado, and west Texas. Also breeds in montane areas in Mexico and Guatemala. Winters throughout the highlands of mainland Mexico, south to Guatemala. 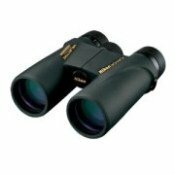 Resident of rugged mountain terrain with cliffs, canyons, and rushing streams. Also, open woodland, especially pinyon-juniper and pine-oak association, brushy slopes, and riparian and montane scrub and thickets. 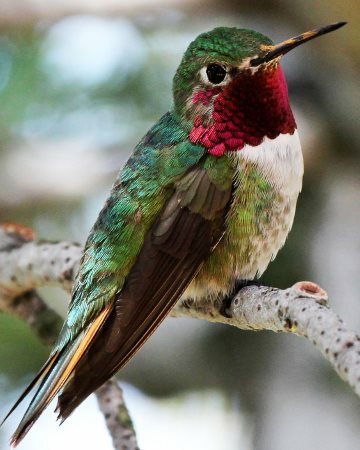 In their winter range, which overlaps with the breeding range of resident populations in Mexico, Broad-tailed Hummingbirds use thorn and oak forests at lower elevations, and mixed oak-pine and cypress as well as fir forests at higher elevations. Male Broad-tailed Hummingbirds returning from migration ahead of the females seek out territories with nectar-rich flowers where they may establish a territory of a quarter acre or more. Territory size will ultimately depend upon food availability as well as density of birds. You will often see males defending a food supply from other hummers. They have favorite perches, usually on a high branch near a flowering bush or feeder. This elevated position gives them an excellent vantage point to watch over their territory. Males will not hesitate to descend aggressively upon almost any intruder in their territory including larger birds, cats, squirrels, human beings, butterflies, moths, bees, wasps, and/or yellow jackets. When an intruder is spotted, they will fly directly at them, chasing the trespasser out of its territory. During courtship, male Broad-tailed hummingbirds fly before the female in a U-shaped pattern, diving from 30'-50'. The dive produces a loud wing buzz. Both birds may ascend to 90', one 4'-5' below the other, before descending together. Males court females for a short time, mate, and then resume their quest for other females. The male's contribution to the breeding cycle is solely his genes, taking no part in nest building, incubation, or rearing of young. Throughout the breeding season, males will essentially spend all of their energy attempting to attract females. Broad-tailed Hummingbirds are one of the highest altitude nesters, over 10,000 feet. Females show strong breeding site fidelity, nesting in the same location, especially if previously successful. Accounts mention use of nests in the same tree or bush year after year. It will return to the same branch and even build a new nest atop an old one. The nest is usually on a horizontal limb, occasionally in herbaceous plants, often over or near a stream. Nests are from as low as 3' to as high as 30'. Inner diameter is ~0.7" (1.9 cm). The nest is composed of lichen, leaves, shredded bark, plant fibers, lined with plant down from the undersides of leaves or spider's silk. Eggs: Usually 2. Shell is smooth, white, unmarked measuring 0.5" (13mm). Females spend 78% of their day on the nest during incubation and 62% of their day on the nest during brooding. Young are altricial* and dark-skinned and are tended by the female alone. Ten to twelve days after hatching, females start to roost away from the nest, where there is almost not enough space for the young to huddle together. *Altricial young are hatched with eyes closed, have little or no down, are unable to leave the nest, and depend on the parents for food. 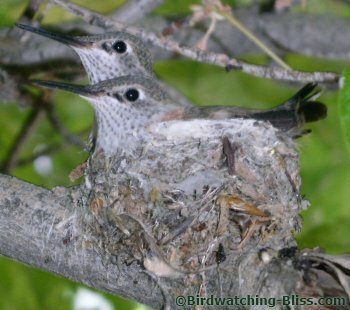 Young broad-tailed hummingbirds will begin exercising & strengthening their wings by rapidly beating them while still in the nest. Preparing for their first flight, they will practice, but with caution. They will hold on to the rim of their tiny nest-cup with their feet to prevent themselves from being swept upwards before they are ready for it. Broad-tailed hummingbirds feed on floral nectar and small insects, spiders, and occasionally tree sap from woodpecker (sapsucker) drillings. Insects are caught in air as well as by gleaning from foliage. Learn more about a hummingbird's diet. Call a sharp, high, metallic chip often given in a short series; similar to Rufous but slightly higher. Chase call tiputi tiputi...like Rufous but lower, variable. Play the Broad-tailed Hummingbird call notes and wing trills made by the male here. In forward flight, characteristic shrill, buzzing whistle made by air rushing through slots created by tapered tips of male's outer wing feathers, especially important in maintaining courtship territories. The male dive display also produces a loud wing buzz. Broad-tailed hummingbirds have many skeletal and flight muscle adaptations that allow for hovering and high maneuverability in flight. They have compact, strongly muscled bodies. Muscles make up 25-30% of their body weight. 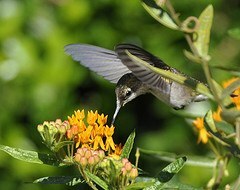 During hovering, Broad-tailed hummingbird wings beat an average speed of 40-50x/sec. Longevity Record: 12 Years and 2 months (according to USGS Bird Banding Lab). Male Broad-tailed Hummingbird photo courtesy of Juan Zamora at Flickr.